I will have postings on track and field for the next three days, beginning with today's on athletes who have been most successful in defending their titles in particular events. 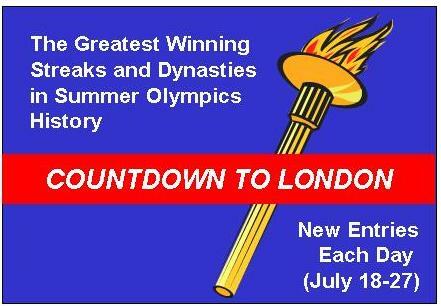 Two names rise to the top of this list due to their "four-peat" performances in their respective events, discus thrower Al Oerter and long jumper Carl Lewis (also a championship sprinter). Both represented the U.S. Athletes who came close to doing what Oerter and Lewis did (e.g., three golds and a silver) are also discussed. The 6-4, 280-pound Oerter, born in 1936, was very young for someone who won four straight Olympic gold medals, ranging in age from roughly 20 to 32 as he won Olympic titles in 1956, '60, '64, and '68. 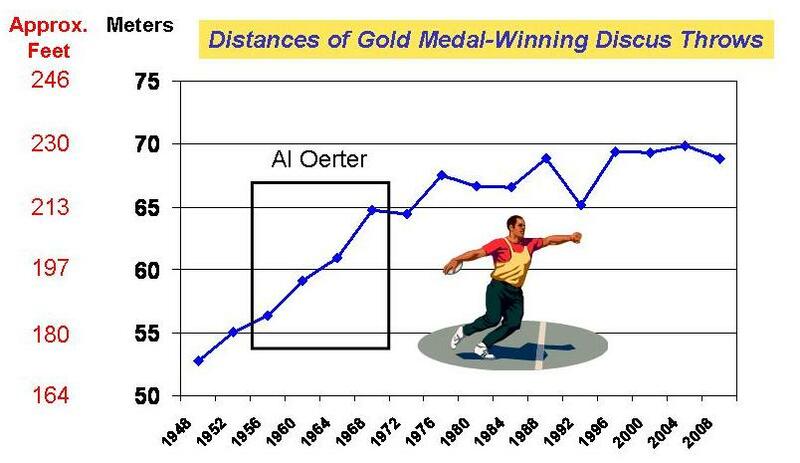 As can be seen in the following graph I created from this database, Oerter improved his winning distance with each successive Olympic appearance (you may click on the graphics to enlarge them). Oerter retired after the 1968 Games. Because of his relative youth, however, Oerter was still a viable competitor when he attempted a comeback in 1980. Because of the U.S. boycott of the Moscow Olympics that year (which was announced well before the Olympic Trials), there is no way to know how Oerter would have done, had he qualified for the American team. For what it's worth, Oerter finished fourth in the 1980 Trials (with the top three making the team), although he threw roughly 14 feet further (69.46 m, 227-10¾) than he ever had when winning Olympic gold. Lewis, born in 1961, won the long jump in 1984, '88, '92, and '96. As shown in the following plot of Olympic men's long-jump data, his best distances -- in the mid-28-foot range -- came in winning his second and third long-jump golds. In the 1991 World Championships, Mike Powell jumped a world-record 8.95 m (29–4½) to end Lewis's 65-meet long-jump winning streak. 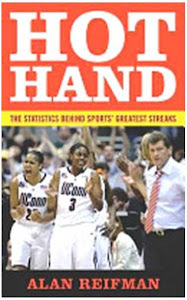 Lewis was roughly 3 inches short at 8.87 m (29–1¼). 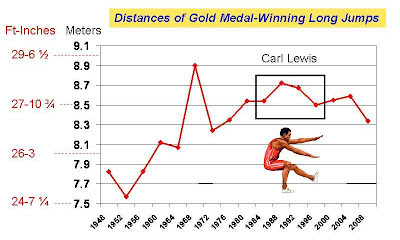 According to this ESPN Sports Century profile of Lewis, "At the 1992 Olympics in Barcelona, Lewis exacted revenge on Powell, who had the record that Lewis craved, when he edged him by 1¼ inches with a leap of 28-5½." 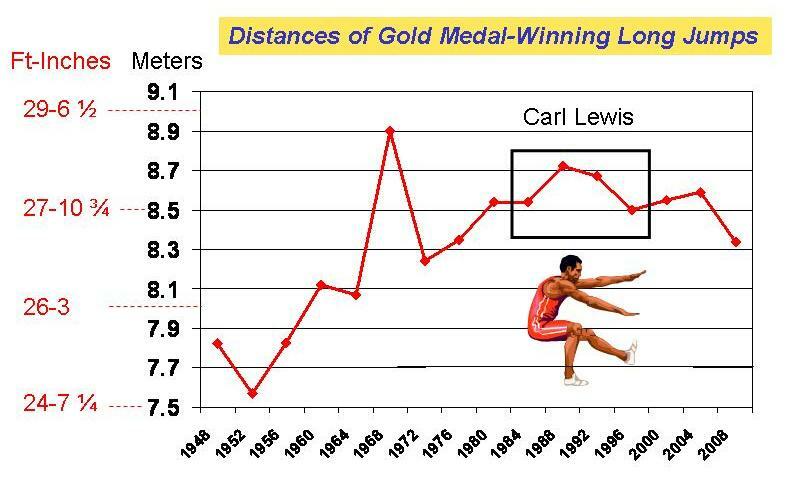 In 1996, the 35-year-old Lewis won his fourth straight long-jump gold, although his winning mark (8.50 m, 27-10¾) was off a bit from his previous Olympic bests. Second-place finisher James Beckford (Jamaica) was roughly 8 inches behind (8.29 m, 27-2½). Powell finished fifth. Three athletes won three straight Olympic golds in their respective events. Men's javelin thrower Jan Zelezny of the Czech Republic took a silver medal in 1988, then won gold in 1992, '96, and 2000. An attempt to tie Oerter and Lewis resulted in a 9th-place finish for Zelezny in 2004. Viktor Saneyev of the then-Soviet Republic of Georgia captured gold in the triple jump in 1968, '72, and '76. With Saneyev jumping at home in the 1980 Moscow Olympics, fellow Soviet Jaak Uudmäe (17.35 m, 56-11¼) edged Saneyev (17.24, 56-6¾) for the gold by a 4.5-inch margin. This report from Sports-Reference, like other accounts over the years, suggests that some questionable foul calls (e.g., for touching their foot beyond the take-off board) on non-Soviet competitors may have helped Uudmae and Saneyev. If one counts events that are no longer held, in this case the standing (no run-up) versions of the jumps, then Ray Ewry of the U.S. warrants mention among three-peat winners. He won gold medals in 1900, '04, and '08 in the standing high and long jumps (plus 1900 and '04 titles in the standing triple jump). But for the 1980 boycott, American 400-meter hurdler Edwin Moses almost certainly would have won three straight golds, as he easily won the event in 1976 (in world-record time) and 1984. His quest for three (non-consecutive golds) came up short in 1988, as he won a bronze medal. During the bulk of his career, Moses compiled a 122-race winning streak. Among women, Jackie Joyner-Kersee is widely considered one of the greatest, if not the greatest, track and field athletes of her time. She won a silver medal in the 1984 heptathlon (a cumulative competition involving seven events), then golds in the '88 and '92 heptathlons. She set a world record at the 1988 Games for most points in the heptathlon, which still stands.